Intel's Optane products so far fall into one of two categories. At the high end is the flagship P4800X enterprise SSD and its derivatives for the enthusiast market. At the low end are the small M.2 modules intended primarily for caching use. It's this latter category that is being upgraded from PCIe 3×2 to a PCIe 3×4 host interface, moving the cache drives and small Optane SSDs more toward the mainstream NVMe SSD market. Based on leaked roadmaps, we know that the original Optane Memory and its refresh Optane Memory M10 are being replaced by the new Optane Memory M15, codenamed Carson Beach. The Optane SSD 800P is being replaced by the new Optane SSD 815P, codenamed Bombay Beach. Capacity options are changing slightly for the M15 cache modules, which offer 16GB to 128GB in M.2 2280 form factor and 16GB to 64GB in M.2 2242 size. The Optane SSD 815P will be available in the same 58GB and 118GB capacities as the 800P. It appears that Intel is continuing with the rather confusing mismatch of advertised capacities between the Optane Memory and Optane SSD products. In reality, the Optane Memory 64GB and Optane SSD 58GB products have the exact same usable capacity, and the same will hold true for the 128GB vs 118GB. The smaller advertised capacities are more in line with how SSD vendors traditionally relate claimed GB to actual usable capacity, while the Optane Memory parts are advertising the nominal raw capacity of their 3D XPoint memory without reflecting space used for error correction or spare area for defect and wear management. The system requirements for the above Optane products are unchanged from their predecessors. Optane Memory caching requires a Kaby Lake or newer platform and the use of Intel's Optane Memory storage drivers for Windows. Otherwise, both the M15 and 815P are standard NVMe SSDs that can be used as regular data or boot drives in any system that supports flash-based NVMe SSDs. The third new Optane product is by far the most interesting: the Optane Memory H10 with Solid State Storage, codenamed Teton Glacier. Where previous Optane Memory products have been intended to serve as a cache in front of a mechanical hard drive, the H10 is Optane caching for QLC NAND, with both 3D XPoint and flash memory on the same M.2 module. The H10 bundles 16GB of Optane cache with 256GB of QLC NAND, or 32GB cache with 512GB or 1TB of QLC. So far, Intel has only shared a mock-up rendering that looks like an Intel 660p and Optane Memory module squeezed onto one M.2 2280 card, but with enough changes to the layout that it doesn't appear to be just a photoshop of images of the two existing products. The first half of the board appears to contain the same Silicon Motion SM2263 controller used on the 660p, and one package each of DRAM and QLC NAND. 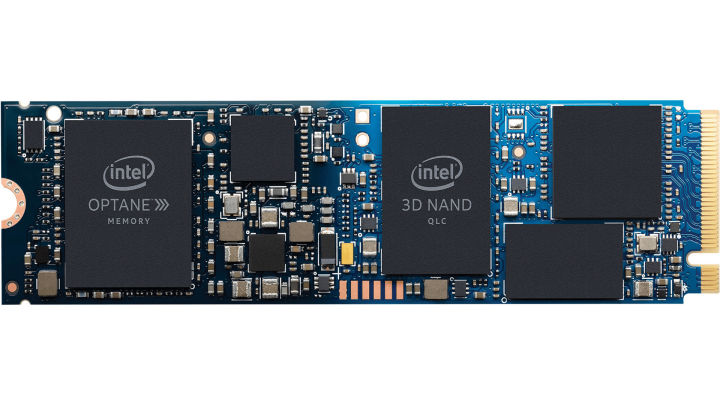 The second half of the board looks like an existing Optane Memory module, with its own controller and 3D XPoint memory packages. We're not sure if this photo is an accurate representation of the real product, but it indicates that two PCIe lanes are routed to the SM2263 controller and two to the Optane controller. This suggests the Optane Memory H10 will appear to the host system as two different NVMe SSDs, and will likely require PCIe port bifurcation support to operate a PCIe x4 M.2 slot as two PCIe x2 links. This could potentially limit compatibility to M.2 slots that use PCIe lanes provided by the PCH. Officially, the Optane Memory H10 will require a Whiskey Lake or Coffee Lake platform. Unofficially, this may be the first Optane product that doesn't work out of the box as a plain NVMe SSD on any platform that supports NVMe. The dual-controller nature of the H10 means that the SSD caching functionality still depends on driver software, and is not managed transparently by the SSD itself. Intel will have to develop a unified 3D XPoint+3D NAND controller to pull that off. Intel has not formally announced any of these three new Optane products, but we expect to get more official information from them soon and will update this article with any new details. The Optane Memory H10 is planned for release in spring 2019 and we expect the M15 and 815P to arrive at the same time or sooner.